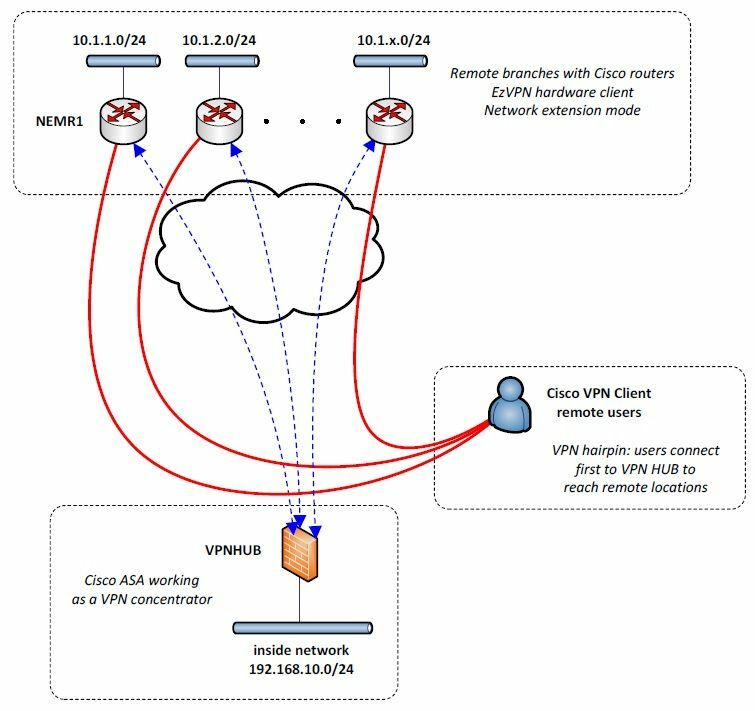 This article is a short tutorial, written to provide a working example of a VPN configuration where the central hub is run by a Cisco ASA firewall and remote devices are either Cisco ASA firewalls or IOS routers, all of them behaving as Easy VPN hardware clients. This kind of network may be useful to manage constrained network contexts where remote branches might not have static public IP addresses available, or even worse where our devices might be placed behind third-party network boxes making some kind of NAT toward the public Internet. It is common to find this kind of difficulties, they could be remote offices in developing countries or industrial plants where the IT infrastructure was not conceived from the beginning to be managed from a central location. The choice of the correct devices for any remote location goes far beyond the scope of this text, we prefer to focus instead on the most interesting configuration details to understand how our goals were translated into Cisco nuts and bolts. External users can connect to a central location using Cisco VPN Client to be redirected to remote locations, literally hairpinning one vpn tunnel into another, this will be described later in further detail. Configuration of branch devices is pretty straightforward, the failover/failback mechanism is basically handled by IP SLA and tracking configuration, but we won’t get into these details here: to accomplish a highly available VPN, the router is initiating Easy VPN tunnels from both uplinks. Easy VPN comes handy, as explained in the overview, when facing constrained branch connectivity since it works using dynamic ip addresses or even being located behind NAT-ting devices. However, this is far from being a best practice and, if possible, better solutions such as DMVPN should be evaluated first as long as we can avoid some constraints. This configuration is currently used in a production network, using Cisco ASA 5510 as the VPN server and Cisco ASA 881 G routers as remote devices. Feel free to contact me if you are trying out this configuration.